Burton, Anthony (2000). Richard Trevithick: Giant of Steam. London: Aurum Press. ISBN 1-85410-878-6. Hodge, James (2002). Richard Trevithick. Lifelines. Aylesbury: Shire Publications Ltd. ISBN 978-0-85263-177-5. Kirby, Richard Shelton; Withington, S.; Darling, A. B.; Kilgour, F. G. (1990). Engineering in History. New York: Dover Publications Inc. ISBN 0-486-26412-2. Rogers, Col. H. C. (1961). Turnpike to Iron Road. London: Seeley, Service & Co..
^ Francis Trevithick, Life of Richard Trevithick,1872. ^ “Steam train anniversary begins”. BBC News. (2004年2月21日). http://news.bbc.co.uk/1/hi/wales/3509961.stm 2009年6月13日閲覧. "A south Wales town has begun months of celebrations to mark the 200th anniversary of the invention of the steam locomotive. Merthyr Tydfil was the location where, on 21 February 1804, Richard Trevithick took the world into the railway age when he set one of his high-pressure steam engines on a local iron master's tram rails"
^ “The romance of the steam engine”. Scientific American (New York: Munn and Co) IV (18): 277. (4 May 1861). "In Trevithick's boiler the feed water was heated by the exhaust steam, which some have supposed was an idea borrowed from Evans, but no proof has been adduced that the Cornish engineer had heard of the prior American invention. We therefore conclude that it was original with Trevithick, but he was not the first inventor." ^ Westcott, G. F. (1958). The British railway locomotive 1803–1853. London: HMSO. pp. 3 & 11. ^ Rattenbury, Gordon; Lewis, M. J. T. (2004). Merthyr Tydfil Tramroads and their Locomotives. Oxford: Railway & Canal Historical Society. ISBN 0-901461-52-0. ^ Tyler, N. (2007). “Trevithick's Circle”. Trans. Newcomen Soc. (77): 101–113. ^ Burton, Anthony (2002). “Coming Home”. Richard Trevithick – Giant of Steam. London: Aurum Press. p. 202. ISBN 1-85410-878-6. 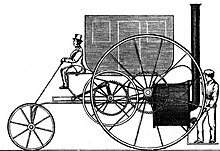 ^ Trevithick Society. Open Lectures and Talks. Retrieved 22 September 2012. ^ Trevithick Society. The Journal of the Trevithick Society, Issues 6-10. Trevithick Society, 1978. ^ Trevithick Society. Archived 2013年1月2日, at Archive.is Cornish Miner - Books on Cornwall. Retrieved 22 September 2012.